Treat your taste buds at Fork & Knife Feast, a February 21st event leading into Cedar Rapids Restaurant Week 2019! 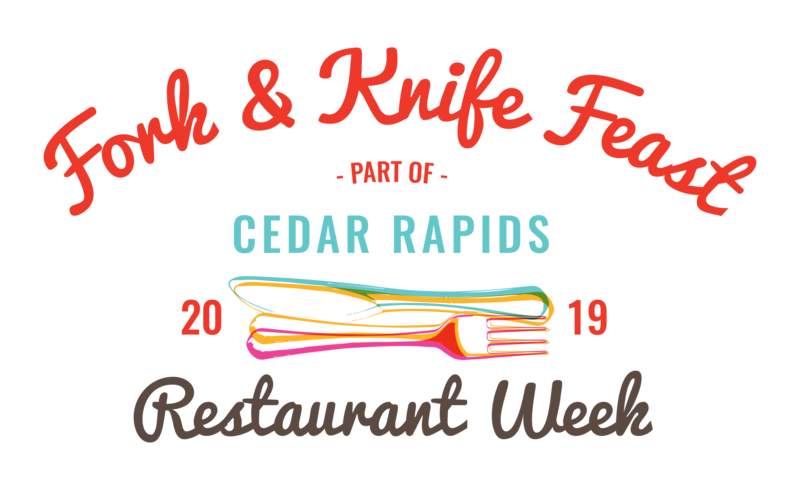 Fork & Knife Feast will feature participating Cedar Rapids Restaurant Week restaurants, who will sample their culinary concoctions and preview items that may be part of their special Restaurant Week menus. A list of participating restaurants will be available in early February. Our lucky winners will receive a pair of tickets to enjoy a fantastic (and tasty) event at Veterans Memorial Building! Don't want to wait for our drawing? You can choose to buy your own tickets today while supplies last. Tickets to this event are $50 before February 19 and $60 at the door (if available). Ticket price includes food and beverage samples from participating restaurants. Tickets for this event are limited, due to capacity. Cedar Rapids Restaurant Week is February 22 - March 2, 2019. Learn more at www.cedarrapids.org/RestaurantWeek.